Recently deceased Sergei Semanov (1934–2011), Russian writer and editor, was at times in his life a Stalinist, a critic of the post-Stalinist Soviet governments, an historian, and a public political commentator closely associated with the nationalist Russian political parties and the Russian Club, all of which peaked in popularity in the late 1960s under General Secretary Leonid Brezhnev. The Russian people generally approved of Brezhnev’s 18-year rule (1964–1982). Although known derisively in the West as a period of stagnation, it gave the people time finally to take stock of Russia’s postwar position in the world and plan for a future such as circumstances would permit. However, even these early subdued expressions of the Russian people’s desire to influence the governance of their country ended abruptly when newly appointed Secretary General Yuri Andropov, an enemy of the nationalists whom he called “Russianists,” had Semanov arrested, interrogated in Lefortovo prison, removed from all his editorial and writing positions, and threatened with expulsion from the Party for the crime of propagating dangerous, possibly treasonous nationalist ideas. Following the deaths of Stalin and Beria and the gradual disappearance of the military heroes of the Great Patriotic War, the USSR was obliged to choose new leaders to manage the affairs of the Russian State in the nuclear age. Unfortunately, because of the enormity of the wartime destruction and the dearth of energetic youthful Party leaders possessing even a fraction of the stature and authority of Stalin, the Soviet Union found itself lacking strong leadership. Although many native Russian intellectuals personally despised Communism, they nonetheless continued to support it as State doctrine for fear that many of the peripheral countries taken over hundreds of years by the Imperial Russian Empire would break away from Moscow if the combined centripetal forces of Moscow, the Party, and State security were not kept strongly in evidence. This façade of the all-powerful USSR was retained as a protective shield even though Russia was bereft of strong leadership, an effective economy, a reliable agricultural base, and a unified nation. The enigmatic subtitle of Semanov’s posthumous The Russian Club: Why the Jews Will Not Win refers to a clandestine society of Russian intellectuals – members of the so-called Russian Club. Semanov was one of the Club’s founding officers who met weekly from the 1960s to the early 1980s to discuss the existing state of native Russian cultural and political affairs, often critical of the official Marxist government positions. So influential had the Russian Club become by 1981 that it can take some credit for the collapse of Communism. Membership in the Club was diverse: some for one reason or another actually supported the government, some backed the Orthodox Church, others — Marxism and the goal of world revolution. But most had no firm convictions (or preferred not to express them). Some were believers, others atheists. The extreme nationalism of German National Socialism appealed to many, especially those “Eurasians” who favored a Great Russia policy. Nationalist resentment against the Jews and their still prominent place in the governance of the Communist Marxist world continued unabated. Underlying and fueling the resentment most of the Russianists felt toward the Communist Party, and which Semanov publicized as best he could, was the close relationship between the Communist Party and Zionist elements in which Jews received preferential treatment as Russia’s elite, especially in politics and the media. The Politburo had already started to crackdown on nationalist dissident writers in 1970 when they removed Anatoli Nikonov, the editor of Young Guard magazine, for being excessively Russophilic. The first victim of the Government’s crackdown on writers it considered dangerously nationalistic was the highly regarded historian Valery Ganichev who was dismissed from his editorial duties in October 1980. Today, however, through the efforts of his professional peers in and outside of Russia, Ganichev is a professor at Moscow State University, and since his election as chairman of the board of the Union of Russian Writers known worldwide in the literary field. It is now quite clear that a major turning point was reached in the mid 1930s in the battle against the destructive and nihilistic. It seems to me that we still do not recognize the importance of the enormous changes made in that period. These changes have had a salutary effect on the development of our cultural world. When Semanov was foolish (or bold) enough to entertain the supposition that Felix Dzerzhinsky, the patron saint of Lubyanka and the Soviet secret police, was himself the product of a Russian-hating Polish-Jewish background, he overstepped the bounds of discretion and self-preservation. The attack on Dzerzhinsky violated the principles of the All-Russian Society for the Protection of Historical and Cultural Monuments and Memorials. Also, by suggesting that the inhuman cruelty of a communist police state to enforce hateful policies like collectivization, the Gulag, atheism, and the rest on the Russian people by non-Russians like the Jews, Latvians, Georgians, et al., who have hated the Russian people since the time of the Romanovs, would only encourage the racists on both sides. His comment that the current Russophobic West is “essentially controlled by Internal Masonic and Zionist financial circles” is also attributed to Semanov. The similarity between Goebbels World War II charge that Jews were the real, behind-the-scene policy makers in both the Soviet Union and the United States cannot escape notice. Recently, in Moscow and other cities of the country a new tendency toward negative and critical thinking has manifested itself in elements in the scientific and creative intelligence sectors. They are referred to as Russianists (rusisty). Under the pretext of defending Russian traditions they are in fact engaged in anti-Soviet activities. … The chief editor of the Man and the Law journal, Communist Party member S. M. Semanov distributes slanderous stories about Communist Party leadership in the domestic and foreign affairs policies of the government. … He emphasizes the need to fight the government. … If we ourselves do not resist, we are lost. Like most Soviet big-city intellectuals, the young Semanov originally shared the political views of his peers until about 1967-68 when two international events occurred – the Arab-Israeli War and the Prague Spring – during which time Soviet “dual citizenship” Jews could no longer conceal their pro-Israel and pro-Zionist bias. Semanov’s nationalism found it increasingly difficult to accept the presence, the policies, and the influence of so many native and foreign-born Judaic Marxists, dual-citizen Jews, Latvians, Georgians, and other minority groups in the formulation of government policies. Some of these minorities, many Slavs believe, actually hate the native Russians and Ukrainians, referring to them as Eurasianists, Russianists, racists and worse. Russian nationalists are determined to keep Siberia an integral part of the Russian Federation while the minorities and internationalists favor Anglo-American and Israeli development schemes to exploit the mineral wealth of Siberia for their own parochial and financial interests. When General Aleksandr Lebed, an authentic Russian hero and governor of most of Siberia, was killed in a helicopter “accident” a few years ago, many Russians suspected foul play. When, near the end of Brezhnev’s term of office, a delegation of “village writers,” led by Valentin Rasputin, complained to Mikhail Suslov, the Chief Ideologue of the Party, about the destructive modernization policies of the government, and the state of the country in general, the group was told quite frankly, “Boys, the ship is sinking.” Rasputin then suggested that Russia secede from the Federation unless and until the Government take measures to protect the Russian landscape against the ravages of irresponsible modernization with the same concern and energy that it expends in supporting international exploitation of Siberian mineral resources. In the real sense of the word Russia in this period had no national elite. None of the leaders, certainly not those in Moscow, would even think of putting national interests above their own personal interests. Not one. Neither those who were charged with deciding the fate of the country, nor the masses of people possessed a Russian national consciousness. As a consequence of the USSR not having a national elite to protect the ownership of all State property rightfully belonging to the Russian people, the arrangements made with the United States for Russia’s transition from State to international capitalism were made by bankers, financiers, and con artists. Details of the transactions are described in . Part 2 of this presentation on Semanov will consist of an article he wrote describing the role of Jewish and other non-Russian NKVD bosses in enforcing Stalin’s purges of the 1930s. 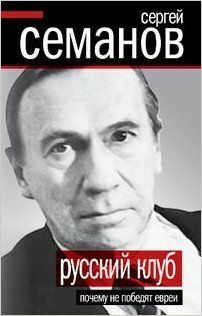 Semanov’s writings have been criticized by some as anti-Semitic and by others as unvarnished factual history. https://www.theoccidentalobserver.net/wp-content/uploads/2018/06/TOO-Full-Logo-660x156-1.png 0 0 Dan Michaels https://www.theoccidentalobserver.net/wp-content/uploads/2018/06/TOO-Full-Logo-660x156-1.png Dan Michaels2013-09-18 17:22:422013-09-18 17:23:12Sergei Semanov and the “Russianists"